So my readers, all three of you 😉 will notice I’ve deleted some pages that have just been placeholders since starting this blog in October of 2008. I will be moving the site to WordPress.org in a few months or sooner perhaps. I’ve never filled those pages as I soon realized the limitations of properly displaying my work made it not worth the effort here. So the new site will have a little bit different structure and will consolidate my portfolio on what I hope will be a much easier to manage and update platform. I’m looking forward to that. In the meantime you can find some cover samples on my old website: Sue Campbell Graphic Designs. In fact that site will become the domain for this here blog. I’ve “rethunk” the purposes and direction of this site many times since starting it. And I’m curious to know what kinds of information you’d like to see on the blog or on other static pages? Downloadable articles and design tips? Photoshop “recipes”? Marketing ideas? A work in progress section—where you can vote on your preferences for cover designs? Links to writing and design contests? Please comment if you have ideas! And thanks. I’ve come across a wonderful new site displaying “the best in book cover design” (as selected by these folks). It does look to be very eclectic and inclusive of good works. I’ll let this other blogpost tell the story sinice they did it so well. The FontFeed blog also looks to be a good source for articles on design and typography. Here’s the direct link to The Book Cover Archive. Does anybody use LibraryThing? Well, I know over 500,000 people are signed up, but does anybody here reading this use it? I signed up as a user back in July of 07, and then promptly forgot about it. The idea of entering all my books manually just seemed overwhelming. But now I see that they have a $15 barcode reader that allows you to scan your books and upload them all at once. You can get a widget for your blog that shows your random covers (if they are linked on Amazon, or if you uploaded them). Though I think it links TO Amazon to buy the book, still I am all in favor of helping writers sell books in whatever way they can. I does have some interesting tools and lists of use to writers, publishers, and readers. For instance, you can see the top 25 books, based on users uploads; read reviews and post your own reviews; connect with authors and other users. You can find bookstores in your area that stock a book you want—independent ones too. There are lots of book centric blogs there, many based on genre or category. I browsed through a YA blog and the comments and posts seemed to be from teachers and librarians (as well as the occasional actual YA). Seeing what this demographic thinks is pretty enlightening. Here’s project I’m working on. 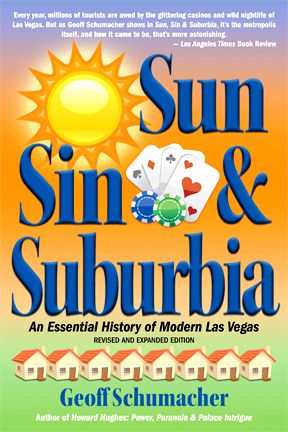 This book Sun, Sin & Suburbia: An Essential History of Modern Las Vegas by Geoff Schumacher has done well. It’s in its third printing and is now going to go into paperback. This is the time a book often gets a new cover. Why? Well in this case, the book has been revised and expanded so it’s almost like a new edition. But often books released in different formats simultaneously are given different cover in each iteration. The reasoning is that the cover functions as the billboard for the book, and as such it attracts the chosen audience. A paperback might have a little bit different demographic to appeal to than a hardbound book. Books released in different countries also have completely different covers—to appeal to the cultural idiosyncracies of the country of release. Some books have been released for both adult and children’s markets, Harry Potter for instance. In that case, in Britain the covers for the adult version were different from the children’s versions. Though, in the US there was only one version of the books—which bore a different cover than either of the British versions. Our book Sun, Sin & Suburbia is now going on five years old. Aside from the new material and format it was time for a freshening up. Here are the old version (on the left) and the new version of the covers. I welcome comments on the change!